Punta Cana can be a good place for windsurfing. However if you are super serious about windsurfing you need to know that the Mecca of wind sports in Dominican Republic is Cabarete (about 8 hours road trip from Punta Cana). Typically windsurfers here use a 5.5M sail and 100L board. 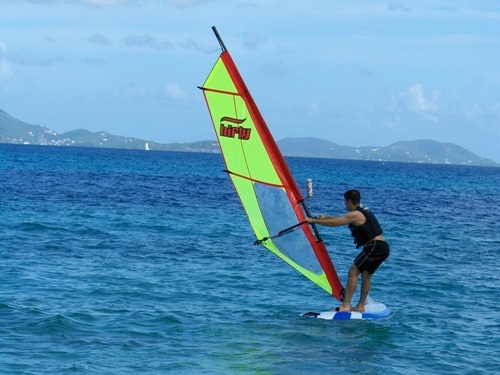 You should be able to rent equipment somewhere but given the fact that it is not the most popular sport here you should try to check with your hotel prior to coming to Punta Cana if you will be able to get any windsurfing equipment and/or lessons nearby. Club Med is one of the places in Punta Cana that does have windsurfs available.